Bob Yttri, owner of the Red Putter, in his familiar perch at the golf course in August of 2016. Photo by Alyssa Skiba. 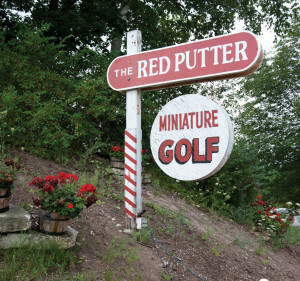 How does a real estate manager decide to give up his job to own and operate a miniature golf course in Door County? The subject of selling the business came up then and there at the red booth that serves as The Red Putter’s on-site office. They shook hands and Bob returned to his family to break the news. His wife didn’t speak to him for a month. But eventually, she came around to the idea with the help of some friends. “Her friends were telling her that some husbands go out and buy nice cars and things like that – but, they said, your husband bought a business,” Bob said. The Red Putter officially changed hands on the first of the year, in 1993. In the 23 years since, Bob and his feathered black bowler hat have become a staple in the Northern Door community. With his easygoing nature and quick smile, it’s not hard to see why he is a favorite for residents and visitors alike. As we talked, a group of patrons stepped up to pick up putters and a scorecard. And Bob does all he can to make sure the fun doesn’t stop. The course’s listed hours are 10 am to 10 pm, but if people are looking to play (and they usually are), Bob will stay open late. “The latest is three,” he said when asked how late he has stayed open in the past. Last year there was a major storm and power was out all over the county. There were lines down everywhere; Bob remembered bare wires being down between The Red Putter and Joe Jo’s Pizza. Most of the county’s businesses were out of commission. But Bob had a generator. “I opened instantly and people were playing instantly,” he said. He stayed open until 3 am that evening and then the next night stayed until 3 am again. 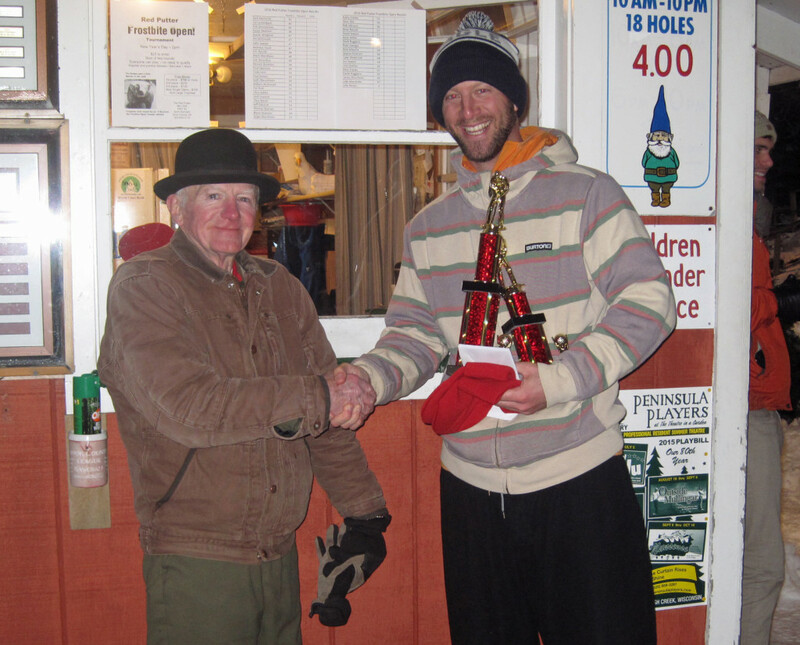 Tournaments at The Red Putter draw competitors from around the country, even in winter. Here Bob Yttri congratulates Nick Kwaterski on his Frostbite Open win on Jan. 1. Rocky Marciano, who regularly putts with a group of friends, also noted Bob’s generosity. The Red Putter is cash only, which throws some people with only credit cards for a loop. But Bob makes sure this policy doesn’t interrupt the family fun. 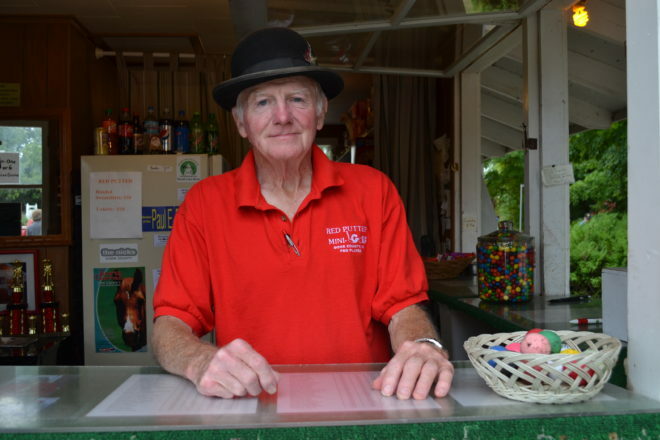 The kindness Bob shows to his patrons – “They’re not my customers, they’re my friends,” he clarified – means The Red Putter holds a special place in the hearts of many. The mini golf course has been part of four films, including the recently released movie The Emissary. In addition, the course has served as the venue for six weddings, including that of the late Edward “Little Eddie” Strege, a beloved local bartender and Marciano’s cousin. He married his wife Megan on Hole 10, which features a miniature church. Bob’s daughter Tracy Yttri Opper, who helps him run the business and organizes The Putter’s two tournaments, was also married there. When asked what he thought of his loyal following and the success he has found at the course, Bob simply shrugged. As long as people are having fun and the business makes a little money, he said modestly, he is more than happy to serve as host. The Red Putter is open early May through late October, roughly from 10 am to 10 pm. It’s located at 10404 State Highway 42, Ephraim.